Yes, you should feel the fatigue mostly in your body if you are doing it correctly. As to the strain on your throat is most likely coming from using to much air. To much air across the vocal chords causing them to dry which is likely what you are experiencing. To learn how to minimize this work on your lip burbles and focus on getting the air flow way down when doing it. This will help you learn to manage your breath correctly. yes, singing is an extreme sport. During my first weeks I was drowning in sweat. 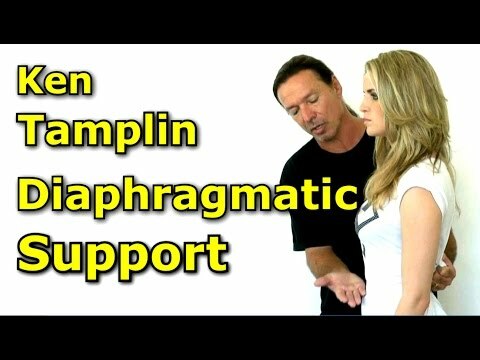 You need to do your best to relax and keep your breath doing as shown in the video above. The even breath is key to keeping your voice from trembling. Hello @highmtn what do you mean by even breath?? I mean that the breath is even. Steady. Not wavering at all. Sir why sometimes i feel like i am straining my chords?? it feels like theres something getting rip off my cords, and it makes me taste some blood, how can i get rid of it?? That should never happen. You might want to go see a doctor about that. You could be singing with far too much force. but right now im doing ok now, theres no strain in the chords and i can do a scale, but i have another question, its about the vocal shaping what kind of sensation must i have?? Andrew, Your home position is the AH vowel, like Ken teaches in so many of his YouTube Videos. Make the sound like he does. I think you may have been trying to sing too loudly if you ever feel pain or taste blood. Be careful to stay within safer limitations with your vocal volume. you're right im trying to belt, but how can i know if what am i doing is right?? @highmtn how can i know the difference between the troat singing and diagpragmatic singing? ?